Office Hours: Spring 2019: Wed. 12-2pm in SRH 3.231; and by appointment. In Fall 2015, Dr. Peniel E. Joseph joined the University of Texas at Austin as Founding Director of the Center for the Study of Race and Democracy. He received a joint professorship appointment at the LBJ School of Public Affairs as the Barbara Jordan Chair in Ethics and Political Values and at the History Department in the College of Liberal Arts. Prior to joining the UT faculty, Dr. Joseph was a professor at Tufts University in Medford, Massachusetts, where he also founded the school’s Center for the Study of Race and Democracy to promote engaged research and scholarship focused on the ways issues of race and democracy impact the lives of global citizens. He received a B.A. from SUNY at Stony Brook and a Ph.D. from Temple University. Dr. Joseph’s career focus has been on what he describes as “Black Power Studies,” which encompasses interdisciplinary fields such as Africana studies, law and society, women’s and ethnic studies, and political science. He is a frequent national commentator on issues of race, democracy and civil rights, and has authored award-winning books Waiting ‘Til the Midnight Hour: A Narrative History of Black Power in America and Dark Days, Bright Nights: From Black Power to Barack Obama. Dr. Joseph’s most recent book, Stokely: A Life, has been called the definitive biography of Stokely Carmichael, the man who popularized the phrase “black power” and led the Student Nonviolent Coordinating Committee, known as the SNCC. 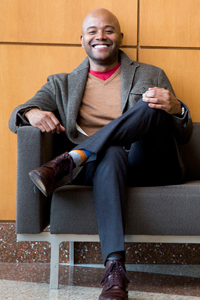 The recipient of fellowships from Harvard University’s Charles Warren Center, the Woodrow Wilson International Center for Scholars and the Ford Foundation, Dr. Joseph’s essays have appeared in The Journal of American History, The Chronicle Review, The New York Times, The Black Scholar, Souls, and American Historical Review. Dr. Joseph is a frequent contributor to Newsweek, TheRoot and Reuters, and, his articles, Op-Eds, and book reviews have been published in newspapers from The Washington Post to The New York Times. Dr. Joseph’s commentary has been featured on National Public Radio, The Colbert Report, PBS, and MSNBC. Black Politics examines the political thought and practice of African Americans from the end of slavery to the present. The course defines “politics” broadly, ranging from movements to elect officals at the local, state, and national level to civic groups, fraternal association, religious, and cultural and educational movements that organized for political self-determination during the Age of Jim Crow segregation that gripped the nation for a century after salvery’s legal demise. A wide range of African Americans have organized themselves in public and private spheres in pursuit of political power; through womens clubs; civil rights organizations; self-help group; labor union; institutes of higher and vocational education; the creation of the public school system; and churches, Black politics has consistently sought to reimagine American democracy as a vehicle for political liberation, freedom, power, justice, love, and compassion. On this score activists supported liberal, conservative, moderate, and radical ideologies in search of a liberated future. Black Republicans, Democrats, socialists, Marxists, Christians, atheists, feminists, and conservatives engaged in vigorous, at times contentious, debates over the direction of Black Politics that is sometimes reduced to the controversy between Booker T. Washington and W.E.B. Du Bois. The Civil Rights Movement is perhaps the best known expression of Black Politics, but far from the only one. Efforts to secure decent housing, health care, good schools, clean neighborhoods, employment, safe spaces, playgrounds, clean water, and healthy environments represent one aspect of Black Politics that is too often reduced to a quest for symbolic representation (black faces in higher places) rather than, as political activist Kwame Ture (Stokely Carmichael) famously advocated in 1966, a struggle for Black Power. Students interested in black politics, civil rights, social policy and the deep connections between the historical development of racial justice struggles and contemporary policy debates and challenges would find this course of interest. Readings: One full-length book and/or article per week. Reading list still tentative. 1) Weekly three-paragraph critical analysis of the readings. This undergraduate seminar focuses on the impact of Barack Obama’s watershed presidency on American democracy. The course books will focus on Obama, the historical and political context that shaped him, and the one he helped to transform as a student, community organizer, state senator, U.S. senator, and two term president. We will read, study, discuss, and critique several different kind of works related to Obama including his own memoir; a critical political and intellectual biography; the first policy assessment of his presidency by a group of historians; and the meaning of his iconography to black Americans. A weekly three-paragraph response on the assigned reading is due by 5 PM the day before our seminar. Each student should read everyone’s essay before the start of class and provide comments, both positive and critical, that will be used for class discussion. Your responses should be submitted in the “Discussion” section of Canvas which will allow you to post your response as well as comment on the responses of others. How does the author approach race and democracy in shaping Obama? How does the history being explored connect to our contemporary understanding of black and Africana identity and what are the theoretic and political implications of the work, both historically and contemporaneously? What’s the argument being laid out and how persuasive do you find it to be? Examine the sources in the bibliography and endnotes to consider the way in which the author has marshaled their evidence. How does the work (book chapter) merit analytically and stylistically? Does the author’s analysis seem persuasive and insightful, even when you disagree? Think about the readings in tandem, both thematically, chronologically, and theoretically. How does America’s complicated racial history and legacy shape the social, political, and cultural contexts that Obama imbibes on his journey intellectualy, personally, and politically? Meetings with Professor Joseph: All students are required to meet with Professor Joseph one-on-one once during the semester. Midterm Assignment: Complete rough draft of final essay. Students are required to write a critical 10-15 page essay assessing President Barack Obama’s impact and influence on American democracy as both a political leader and symbolic figure. Based on our readings this semester, what makes Barack Obama such a historic figure? What are his most important successes and failures? Did Obama’s presidency lead to greater racial progress in the United States and around the world? If so, provide three specific examples of why. If not, provide three examples of why not. If, as I suspect, his presidency proved a more complicated and contingent phenomenon, outline the nuances here as well. As a candidate in 2008, Obama offered himself as part of the “Joshua Generation” standing on Dr. Martin Luther King Jr.’s shoulder. Yet many critics alleged that President Obama’s use of drone strikes, his failure to prosecute Wall Street crimes, and his unwillingness to promote radical policies to promote racial and economic justice betrayed King’s legacy. Others countered that his support for equal pay for women, the passage of the Affrodable Care Act, promotion of environmental protection, and effort to scale down mass incarceration offered definitive proof of Obama’s social justice commitments. Given what we have read in great detail this semester about the world that shaped Obama—from both his and various critics, journalists, and historians’ perspective—what will future Americans and world citizens define as his enduring legacy? Our semester reading list provides a sample of many of these issues, but of course is not exhaustive. How has this scholarship impacted the real world and what are its flaws, omissions, strengths, and weaknesses? Baker, Obama: The Call of History, Ch. 1. Baker, Obama: The Call of History, Ch. 4. Baker, Obama: The Call of History, Ch. 6. Zelizer, The Presidency of Barack Obama, Ch. 8. Books can be found at the MAIN Co-op, on Guadalupe, under HIS 350R/unique# 39227. They are also on reserve at the Benson Latin American Collection Library in SRH 1 and can be borrowed for 24 hours. In addition, those that are offered as e-books for checkout from UT are noted below. Dyson, Michael Eric. The Black Presidency: Barack Obama and the Politics of Race in America (New York: Hoghton Mifflin Harcourt, 2016). Baker, Peter. Obama: The Call of History (New York: Callaway, 2018). Obama, Barack; Dreams From My Father: A Story of Race and Inheritance (New York: Three Rivers Press, 2004). Zelizer, Julian E., ed., The Presidency of Barack Obama: A First Historical Assessment (Princeton, NJ: Princeton University Press, 2018). By UT Austin policy, you must notify Professor Joseph of any pending absence to observe a religious holy day at least 14 days in advance of the day you wish to take an absence. If you miss a class to observe a religious holy day, you will be given an opportunity to complete any missed work within a reasonable time after the absence. The Black Power Movement represents one of the most important and controversial social and political movements in postwar American history. This graduate redings course examines how the movement for black political self-determination during the 1960s and 1970s transformed American race relations, accelerated the pace of black elected officials nationally, erected new educational, social, political, and cultural institutions nationwide and redefined black politics, identity, and culture. We will also explore the movement’s critique of, and participation in, civil rights struggles; its reimagining of American Democracy; efforts to gain political and economic power within America society while redrawing the landscape of race relations. 1. How does the author approach Black Power? How does the history being explored connect to our contemporary understanding of black and Africana identity and what are the theoretic and political implications of the work, both historically and contemporaneously? 2. What’s the argument being laid out and how persuasive do you find it to be? Examine the sources in the bibliography and endnotes to consider the way in which the author has marshaled their evidence. 3. How does the work merit analytically and stylistically? Does the author’s analysis seem persuasive and insightful, even when you disagree? 4. Think about the readings in tandem, both thematically, chronologically, and theoretically. How does Black Power’s critique of American democracy play out in the work? What are some of the movement positive, negative, and unexpected or unanticipated outcomes, legacies? Midterm Assignment: Rough Draft of Final Historiographical Paper. This historiographical essay will chart the the historiographical contours of the burgeoning scholarship on the Black Power era; its relationship with the history of the Civil Rights Movement; its local, national, and global contours; the movement’s impact on policy, politics, culture, and society; its critique of American democracy and how its remembered in American history and popular culture; its impact on radical, liberal, feminist, conservative and other intellectual and political perspectives during the Black Power era and now; its resonance with contemporary social movements in the Age of Black Live Matter, Occupy, March For Our Lives, #MeToo, and LGBQT movements. This graduate seminar focuses on black intellectual, political, cultural and literary and historical figures during the course of the long twentieth century. The course examines the evolution, conflict, and debate surrounding the development of political and intellectual ideologies in pursuit of racial justice, citizenship, and equality, (ranging from liberal-integrationist, feminist, conservative, black nationalist and beyond) within the black community from the Great Migration to the present. Students interested in black politics, civil rights, and social policy and the deep connections between the historical development of racial justice struggles and contemporary policy debates and challenges would find this course of interest. Students will be evaluated on the basis of three criteria. 1. We will generally read one book per week. Students will write a weekly three paragraph response paper that will serve as a basis for class discussion. 2. Class participation in discussion, which will provide each student an opportunity to lead an interactive conversation about the reading. 3. The final paper will be a 25 page historiographical essay exploring the contours of the black intellectual tradition, paying special attention to the way in which history informs contemporary social justice dialogue, debates, and policy. This course examines the way in which racial bias in American history, policy and politics has impacted the relationship between African Americans and the justice system, from the convict lease era in slavery's aftermath to the crisis of mass incarceration and the age of Black Lives Matter. We will pay particular attention to the history and impact of federal anti-crime policy on sentencing, mandatory minimums, DOJ Byrne Grants, the militarization of local law enforcement agencies, the drug war, juvenile justice, and prisoner rehabilitation and rights since The Great Society. The course will take a panoramic view of the history of race and the criminal justice system. Beginning with the history of black criminalization after Reconstruction and focusing especially on postwar America’s institutionalization of a racialized criminal justice system and its corresponding impact on communities of color. We will examine what Michelle Alexander has labeled the New Jim Crow, the system of mass incarceration that makes the criminal justice system a gateway to multiple systems of oppression to a wide range of blacks and Latinos. Weekly three paragraph critical analysis of the readings. Midterm assignment of a 2-page policy brief: this will include a short, group presentation on your brief. More information on this assignment will be provided in class. Final 20 page critical historical and policy analysis on a specific aspect of criminal justice reform (e.g. ending money bail system for criminal defendants charged with low level warrants). We will read one book or article per week. This course examines the historical Civil Rights Movement and how its impact on public policy transformed national race relations and ideas of citizenship and helped to redefine American democracy. We will examine the interactions between ordinary people and democratic institutions, social movement leaders and presidents, community activists and policy makers in trying to reimagine notions of equality, citizenship, freedom and democracy. Some questions we will ask: What was the Civil Rights Movement and who were the major players, actors and organizations that shaped this movement? How did grassroots activists shape the movement for racial, economic and gender justice during this era? What role did presidents and political leaders play in shaping the movement’s national policy aspirations? The course will examine the historic CRM as a vehicle to discuss contemporary civil rights debates, especially voting rights and criminal justice reform. The course will take a panoramic view of the civil rights period, beginning during the New Deal and concluding with a discussion of Black Lives Matter. Along the way, we will discuss the CRM’s heroic period, including the roles played by Martin Luther King, Jr. and Lyndon B. Johnson, while also paying careful attention to the way in which community activists at the grassroots level shaped a movement we still too often think of solely in national terms. Finally, we will explore contemporary policy debates over voting rights, mass incarceration and racial segregation and see how (and if) past policy debates inform current ones. This course examines the way in which racial bias in American history, policy, and politics has impacted the relationship between African Americans and the justice system, from the convict lease era in slavery's aftermath to the crisis of mass incarceration and the age of Black Lives Matter. We will pay particular attention to the history and impact of federal anti-crime policy on sentencing, mandatory minimums, DOJ Byrne Grants, the militarization of local law enforcement agencies, the drug war, juvenile justice, and prisoner rehabilitation and rights since The Great Society. This course examines the modern Civil Rights Movement (CRM) from the Great Depression to the present. The CRM is most popularly identified with its heroic period, from 1954-1965, that featured watershed legal and legislative victories, but the movement predates school desegregation and continued long after the passage of the Voting Rights Act. This seminar will explore the CRM in four parts. social movement leaders; the grassroots and community activists; presidential leadership; and contemporary civil rights struggles for voting rights and criminal justice reform and their national policy impact. We will play close attention to how ordinary people, community activists, social movement leaders, politicians, presidents, and the American people debated, shaped, and thought about national policy, especially as it related to bread and butter issues of employment, residential and public school segregation, housing, criminal justice, voting rights, citizenship, and democracy.